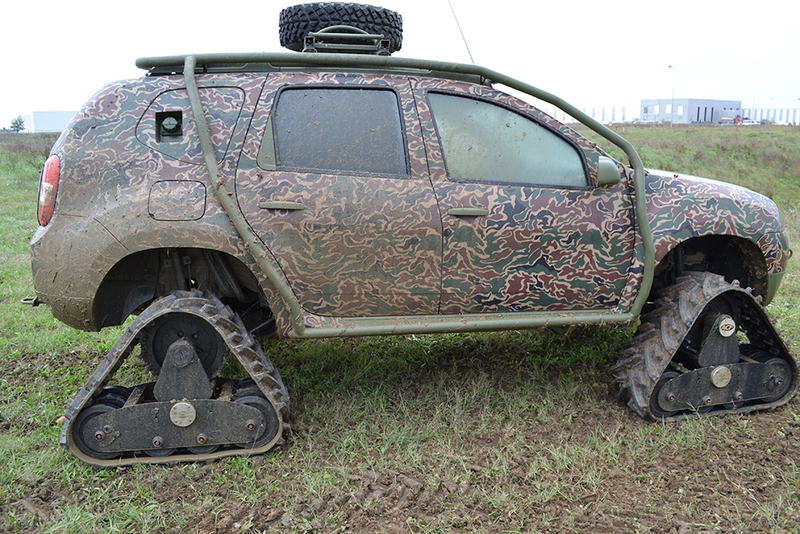 The Romanian journalists from Auto Test Magazine have tested a Duster track prototype near to Bucharest. The model has military camouflage and triangular tank tracks installed. Who wouldn’t want to test an SUV with a track system on a muddy terrain? Well, the journalists from Auto Test Magazine have been lucky enough to test a Duster Army with triangular tank tracks in Titu, at the Renault Technical Centre. The terrain had some muddy slopes but the Duster Army passed smoothly through mud and puddles without any problem. 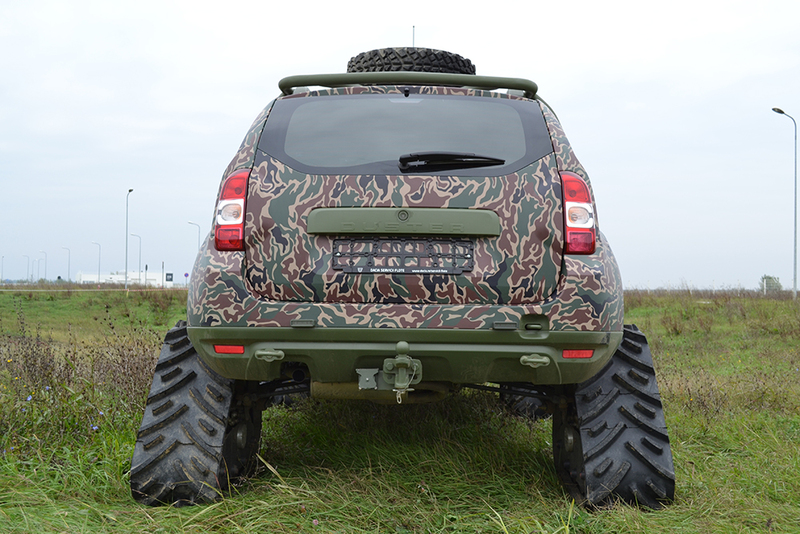 The Duster with tracks has a width of 2160 mm and an increased ground clearance with 210 mm. The triangle tracks have 1000 mm in length, 350 mm in width, 770 mm in height and a weight of 111 kg each. The Duster model tested was a 1.5 dCi engine with 110 HP and with ACF tracks installed that are specially made for mud, sand, snow and water and even the roads. This rubber tracks with aramid reinforcements help reduce the pressure on the soil up to 15 times compared to standard wheels. Even more, because the track has a smaller sprocket than the wheel the ACF track system will give the car an extra torque up to 1.33. The producer says that a person can mount the ACF tracks in one hour on a standard 4×4 model. 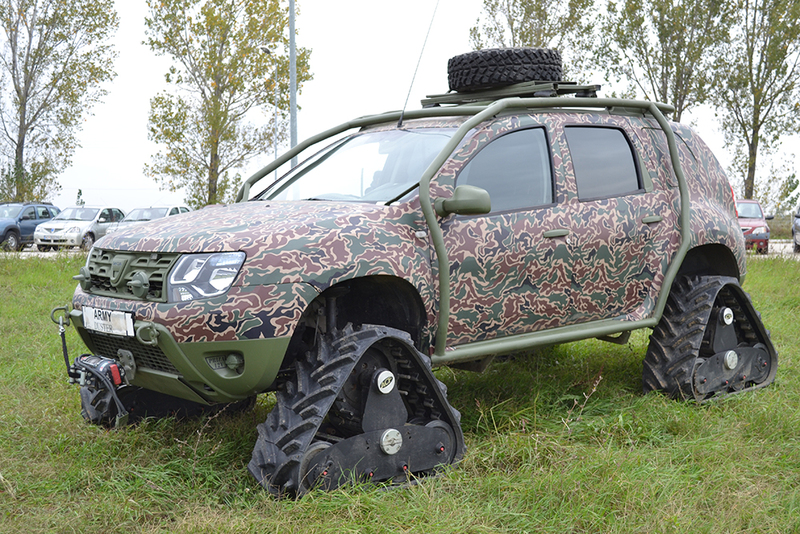 The price of a rubber track conversion system for a Dacia Duster 4×4 is 9400 euros.